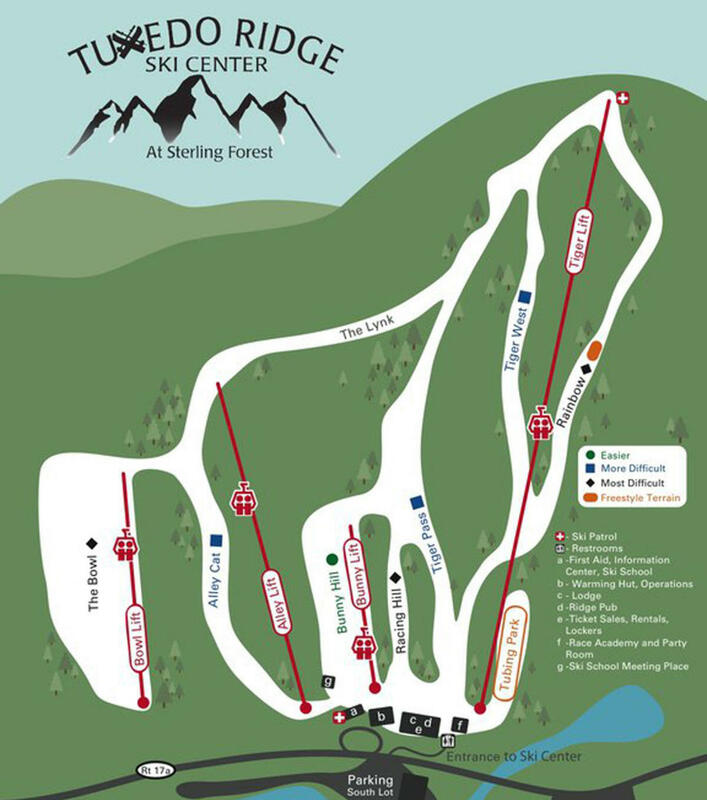 Tuxedo Ridge Ski Center is located in the historic Sterling Forest State Park, conveniently located off the New York State Thruway. This privately run ski center offers a lodge, ski shop, rental shop, rental repair shop, pub restaurant, cafeteria, a ski school as well as a birthday party room. The center originally opened in 1962 as Sterling Forest Ski area. It operated under this name for several decades and gained popularity due to its proximity to New York City. The current owners have operated Tuxedo Ridge Ski Center at Sterling forest for the past 7 years. Tuxedo Ridge Ski Center has long been known for it’s family based philosophy and it’s learn to ski programs that have become increasingly popular over the years. Tuxedo Ridge Ski Center offers a mix of terrain. The “Bowl” offers more advanced skiers and snowboarder’s a challenge, while Tiger West is more suitable for intermediate and advanced beginners. The ski center also offers a NASTAR racing academy for school ages children as well as a race league for adults. Snowboarder enthusiastics enjoy the Rainbow Trail. In addition, Tuxedo Ridge Ski Center offers night skiing and a tubing park. In the past year, Tuxedo Ridge has undergone a massive refurbishment. The hope is that Tuxedo Ridge will become a year-round destination with summer concerts. Past summer events include the Spartan Races, the Mighty High Grateful Dead Festival as well as the Ramapo Music Folk Festival.